Combine some of Mauritius' famed historic sites with an ecotour on this private full-day excursion. 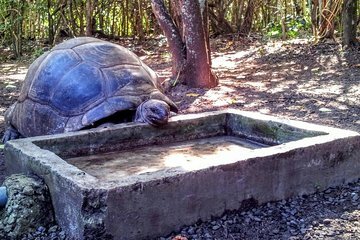 The day starts with a boat transfer to Ile aux Aigrettes nature reserve for a hike, where you may see a giant tortoise. Next, enjoy the white sand beach at Blue Bay before visiting Mahébourg historical village. The day ends with a tour of the National History Museum (Naval museum) housed in a French colonial mansion.